Business Development Manager at Tricketts Insurance says: “I do a bit of running, but running a marathon has always sent a shiver down my spine. However it has always been on my lifetime bucket list and I wanted to raise money for others with limited time left in their lives to complete their final wishes”. 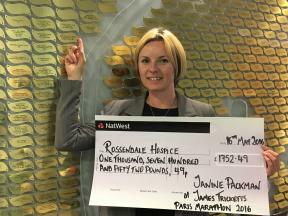 On 3 April, Janine Packman, 36, mother of one successfully completed the Paris Marathon in 4hour 50 minutes and raised £1500 for Rossendale Hospice. 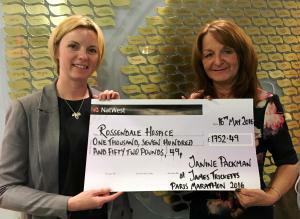 Janine set herself a personal target of raising £1000 to enable her to recognise her achievements by having a gold leaf on the Rossendale Hospice ‘giving tree’. 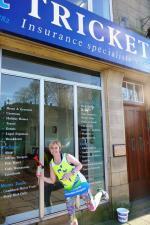 In sponsorship Janine has raised £1130 which Tricketts Insurance Brokers have generously topped-up to £1500. 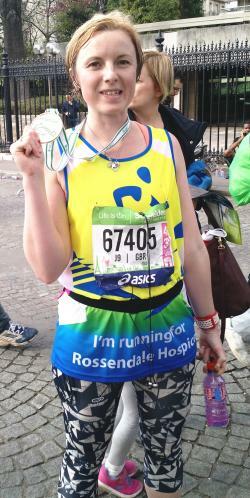 “Running in twenty one degrees was exhausting, something I hadn’t been used to in Rossendale. After twenty miles I was really tired and stopped every mile to re-hydrate, knowing how kindly people had been sponsoring me definitely kept me motivated to finish”.